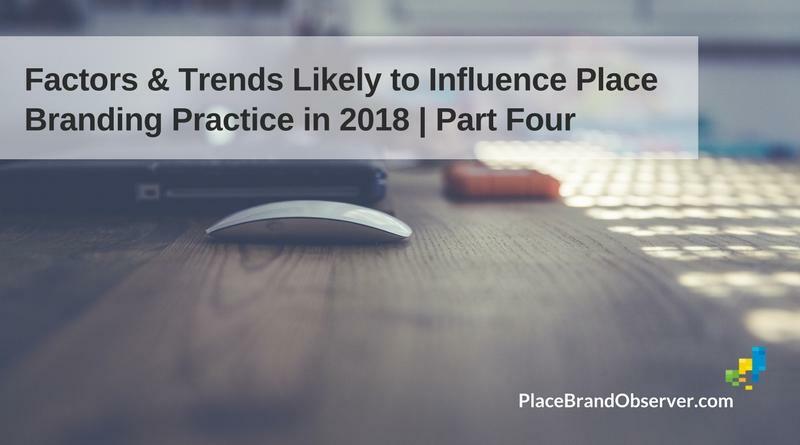 Focus on new markets and niche consumers is one of the main trends likely to influence place branding practice in 2018, according to our panel of place brand researchers, advisors and managers. The last decade has brought many shifts in tourism consumption and the way places are experienced. We moved from collecting magnets to collecting experiences. Analysts of consumer behaviour mention “fear of missing out” as a factor. Emerging destinations are fighting to position themselves on a map and “authenticity” has become a buzzword when talking about place branding and marketing. Here the thoughts shared by our experts on what the new markets will be and who the new consumers are. Ben Knapp pointed out that Millennials are overtaking boomers as the largest generation in the western markets, which requires rethinking existing place brand strategies and the way they are implemented. He thought that it is crucial for destinations to identify smaller niche (or even “micro-niche”) audiences in order to understand their assets. This collision of the old and the new in the form of new challenges for the place brander was mentioned by Charles Landry. He explained that cities aim to “attract the outsider – the interesting, the ambitious, the talented, the investor and even the tourist”. On the other hand, many cities are apprehensive of the new, the different and change in general. So, the challenge place branders and marketers face will be to get “both the outsider and the insider to feel that making and shaping the city is a joint endeavour”. Gunter Soydanbay [Soydanbay Consulting] and Gustavo Konisczcer addressed the rising need for authentic and welcoming places. Current issues such as overtourism and tourismophobia might shift the trends, from places applying cost leadership strategy and destinations focusing on the quality of the visitors to a new, “white space”. This could possibly give way for secondary and tertiary places in already mature destinations or allow for more remote places with preserved authenticity to come to light. Raquel Goulart also saw unconventional place brand experiences as one of the key emerging trends, as well as less known destinations improving the strength of their brand, becoming more attractive with “original and competitive positioning”. Natasha Grand suggested the change is seen in an “era of the search for a meaning”. According to her the question will be not how but what to promote, as decision makers will have to understand how can they create a wholesome experience for their own people, employ tradition and finally answer – why should young people stay there? A new political sphere and influence of media might also push us to ask why is a particular story told. We thank our experts for their insight and hope their diverse fields of experience will help place branders, marketers and decision makers understand current and emergent trends, identify the assets and overall, navigate the way to successful places. Get to know all panel members, their backgrounds and stories here. Analysis and writing by TPBO research associate Maja Jović.